The weapons of winter are strong and harsh, and even solid well-tended surfaces show their impact. Cold, both prolonged and erratically interrupted; rain, snow, ice (and the chemicals used to prevent their damage); and wind from all directions make getting through winter a whole year’s work all by itself. A particularly destructive weather pattern is blandly described as the freeze-thaw cycle, implying some sort of regularity in a chaos of freezing and melting that assaults the integrity of paved surfaces. The destructive capacities of salt, sand, and chemicals intended to protect the safety of people and their activities are applied to paved surfaces with punishing friction, pounding and heavy machine weight. Fortunately, SureCrete can supply all the remedies you need for concrete problems caused by winter. 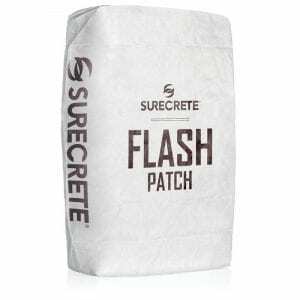 As you inspect residential and commercial properties for signs of winter damage, remember that SureCrete has expertly-researched, easy-to-use, durable products for all kinds of winter damage. And they come wrapped in an unbeatable technical-assistance package composed of videos, direct dealer assistance, and nationwide problem-solving phone lines. At SureCrete, problems are to be solved, not suffered, and the size of the job has no bearing on the amount of attention it merits. Eventually, in concrete work, there’s no such thing as a small crack. Repeated friction from heavy equipment on an industrial floor, stress on concrete stairs and walkways, traffic on a garage or repair-shop floor and skateboards, bikes and even foot traffic on paved recreational spaces take their toll. What looks like a dropped handful of toothpicks in the fall can reach vehicle-jarring proportions by spring. Patches of spalling spread larger with each dose of standing icy water. In snowy areas like the Northeast and Northern Middle West, the repeated freeze-thaw cycles characteristic of winter weather make the seep-swell-melt process of water a perniciously destructive force that requires attentive maintenance year-round. Damage is compounded by ice-melting and other winter chemicals, sand, gravel, and snow-removal equipment friction. Cracks enlarge, fasteners and fittings loosen and even large solid structures can develop weak spots that require much more extensive—and expensive–repair. SureCrete offers two reliable products to keep cracks small and inert on a wide variety of surfaces. 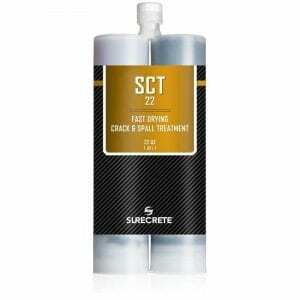 The first, SureCrete’s SCT-22, is a high-strength, low-viscosity rapid-set urethane designed specifically to fill and repair static cracks and repair spalls. It can stand alone as a repair material for floor, wall and other surface cracks, although its rapid-set properties (15 minutes from application to drive-over) make it easy to use as part of a larger decorative-overlay repair project. In addition to industrial, corporate and public-facility uses, SCT-22 is a material easily used by home-repair-focused consumers with basic DIY skills. SureCrete’s website and its network of dealers offer simple, clear instructions for homeowners repairing worn and cracked concrete. The website lists all equipment and materials needed for a repair project, lays out the tasks step-by-step, answers frequently-asked questions and provides a list of other surfaces and situations that can benefit from SCT-22 crack-repair. SureCrete’s second crack-repair product is SCT-EP, a “traditional epoxy” repair system, intended to fill cracks in a wide range of concrete surfaces. SCT-EP repairs can stand alone or prep surfaces for decorative overlays. Directions are clear but appear a bit more challenging to a DIY consumer. Equipment and techniques remain simple and straightforward, but dry-time can be as long as 8 hours, sand is mixed with epoxy to form a slurry, and materials are clearly intended to address more severe problems than rapid-dry SCT-22. An ambitious homeowner may want to take fuller advantage of SureCrete’s dealer expertise and telephone advice. The list of projects for which SCT-EP is suitable—driveways, residential area floors, and exterior walls and stairs–also suggest the versatility of this heavier hitter. 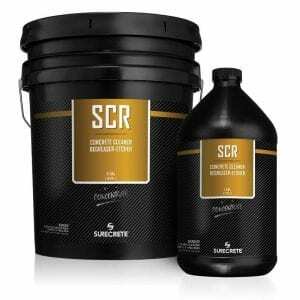 For professional work, SureCrete offers ample support for its claim that SCT-EP is a complete crack-filler. Once cracks are filled, choosing the right decorative coating will bring life back to concrete surfaces, protecting them from further weather-damage while making them look new again. For driveways and sidewalks, one of the simplest but most effective spring coats is SureBroom. Described as a high-strength thin overlay for high-traffic areas, SureBroom is the first choice for residential driveways and sidewalks, as well as commercial parking decks and lots, pathways, pedestrian plazas and retail store floors. SureBrooom can be applied via squeegee, compressed air, or, as the name so clearly states a concrete broom. Sold in grey or white, SureBroom can easily be tinted to match your outdoor hardscaping, school, team or proprietary colors or hues that make the structure blend into the overall setting. Premeasured, stable, iron-oxide pigments can be added to white or grey Surebroom at the time water is incorporated. 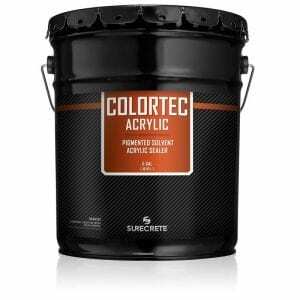 A roster of 30 Surecrete Solid Color Paint Concrete Stain Colors assures U/V resistant, durable, vivid choices of greens, browns, tans, grays, reds, and greys. Custom colors are available on demand. In cases of heavy wear or marked color-change, applying two coats of tinted SureBroom may be necessary to assure long-lasting color consistency. Semi-transparent stains, available premixed in a spectrum of 10 grey, brown and red tones, make it easy to transform indoor and outdoor paved areas into free-standing elements of décor. SureCrete’s Eco Accent is powder-based and can be combined with water for spray or broom application to large surfaces like pool decks, patios, driveways, outdoor rooms, and theme-park or other recreational areas. 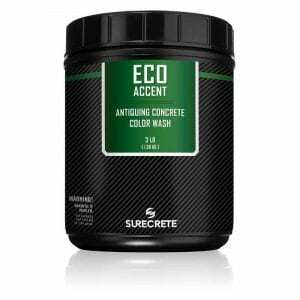 VOC-free and UV stable, Eco Accent can be used as the primary colorant for new concrete or a depth-adding second layer of color in combination with an existing overlay. SureCrete’s stamped exterior clear sealers are most protectively effective when reapplied on a regular annual or two-year renewal schedule. In areas exposed to prolonged sunlight or heavy traffic, some fading is to be expected. Simple mixing and application procedures mean that reapplication can be done effectively even by those with limited DIY experience. Eco-Stain’s semi-transparency adds visual depth and texture to any stamped concrete surface. Final results are no less spectacular for being slightly unpredictable. A second coat can add unexpected dimensions to natural dappling and streaking. With a little practice, anyone applying Eco-Stain can become expert at modifying contrast and intensity of final color. Drying time for each coat is rapid because of the water base. 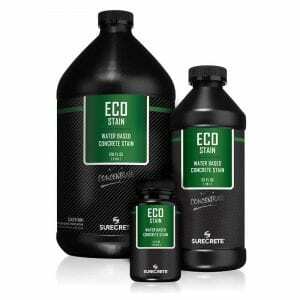 Finishing and preserving the job is as easy as the Eco-Stain stage. 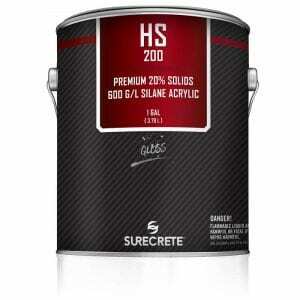 SureCrete’s HS200 Series Exterior Clear Stamped Concrete Sealer can be applied via roller or sprayer. Results are a spectacularly clear, durable silane acrylic finish that protects and enhances underlying colors. HS200 Series is strong enough to protect surfaces from vehicular traffic as well as heavy foot traffic. 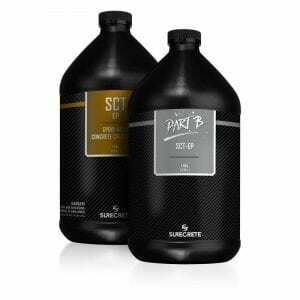 Composed of 20% solids, it is available in a standard 600g/L and low-VOC 400g/L formulas. Slow-evaporating solvents give workers a long time to apply an even coat. Silane manages moisture migration, therefore reducing possible effluorescence and providing additional protection as the acrylic surface wears. The resulting clear, glossy finish makes HS200 Series an ideal cover for stamped driveways, sidewalks and open paved areas subject to frequent freeze-thaw damage; garage floors; pool decks; freshly poured or heavily worn sealed concrete surfaces with high exposure to weather and foot or vehicle traffic. For best results, make certain surfaces are cured, clean and free of all contaminants. Temperatures during and after application of HS200 Series must be between 50 and 90 degrees F, and there should be no precipitation in the area for 24 hours after application. Whether you are sealing Eco-Stained or other concrete, apply HS200 Series in thin, even coats rather than a single thick one. Two coats are usually adequate annual coverage for most surfaces and structures. Especially in a setting with a variety of damage issues—floor and wall cracks chipped stairs, spalled floors, sunbaked surfaces, metal rails, and other fittings—nothing protects surfaces like paint. 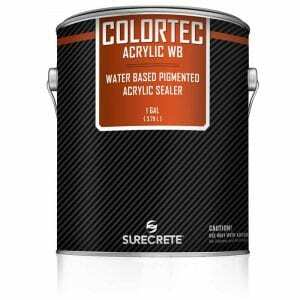 The best of the best, SureCrete ColorTec Acrylic WB is a water-based paint and sealer specifically formulated to address the hardest problems concrete paints are expected to deal with: color instability caused by exposure to UV light and peeling in reaction to freeze-thaw cycles. 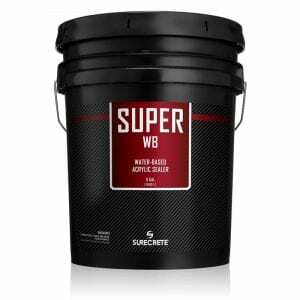 The pigmented-WB formula is designed to protect concrete surfaces while taking an eco-friendly green stance unique among long-lasting concrete paints. For driveways, walkways, benches, stairs, pedestrian plazas, sports arenas and other public areas in constant exposure to harsh weather, no other product can achieve ColorTec Acrylic WB’s tenacious penetration, long-lived water-repellant gloss, and color stability. ColorTec puts a rainbow of resources in customers’ hands. Over 200 color choices are available on same-day demand at SureCrete locations throughout the U.S. and Canada. SureCrete technology makes it possible to fulfill even wider-ranging color requests: a new topcoat matching a competitor’s poor-performing coverage, for example. Seek out SureCrete for team colors at all levels, from university classics to home-sewn pinnies. Trust SureCrete with the protective formulation of your brand or proprietary colors. The company’s bond between technical expertise and respect for client confidentiality lets you fly your color flag with pride. Winter can’t last forever. It just seems that way. Give the concrete surfaces in your charge a nudge into spring. SureCrete concrete repair products stand ready to mitigate the damage of winter weather, backing good looks with solid science and protection you can rely on.